He cried all the way there but in the waiting room he went silent. After about one and a half hour we got to meet a veterinary. He listened to our story and examined Albert. He said that Albert should be X-rayed to determine the cause for his symptoms and get intravenous fluids since he got dehydrated from throwing up. He also had to stay in the hospital during the night. I started to fight tears. He is our little sunshine, always well and healthy and here he was in pain, to be separated from us. No one from our cats spent the night in hospital, ever. The vet said that they would call us at anytime if he gets worse, otherwise they would call us on Saturday after lunch hour. We went back home, sad, thinking what went wrong, what we have done etc. Our big cats were looking for Albert and Leroy got anxiety and cried until late in the morning. The next day another vet called. They saw on the X-ray that Albert was very constipated so they gave him an enema and luckily that helped him pass a huge ball of digested food. He got more fluid and started feeling better. They did not have to operate him to get the stuff out. The did a blood checkup and all was fine except for one thing – ALT liver enzyme. They did not know why. He had no infection, and he is a healthy young cat. They do not perform ultrasounds on weekends, but they wanted to give him a checkup later this week and do more blood work. He was cute and charming and everyone liked him. 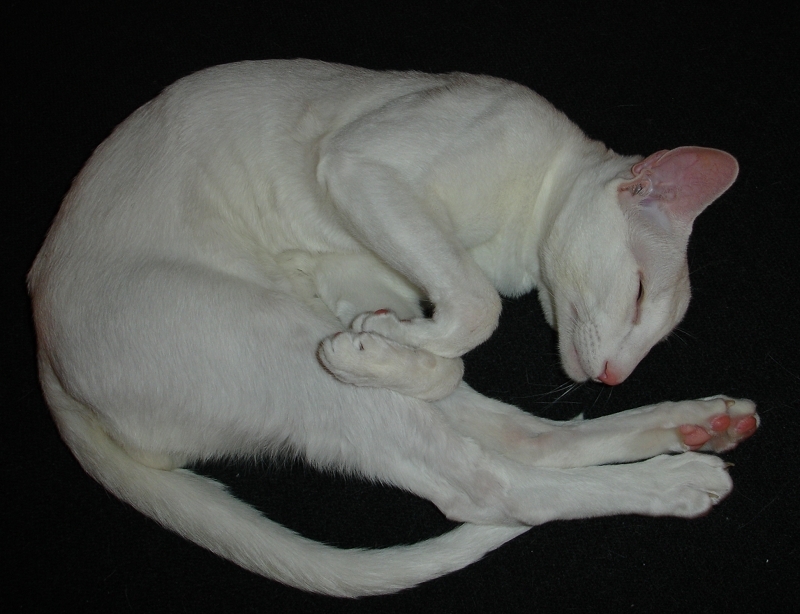 A white Siamese! You do not see those often, if ever! We were very relieved, but also a bit worried. Why is that enzyme elevated? His mother and father had regular checkups every year, the latest one this spring, and all the liver values were always perfect, including that very enzyme. That was not tested on Albert (yet), since he is so young and was always in perfect health. I googled, but the results I found were inconclusive without more checkups. The vet said Albert had to stay there for one more day at least, until he starts eating and everything seems normal again. They called us again today. Albert was not eating. He was sitting in the deepest part of the cage, did not communicate with them at all and refused to eat or drink. The vet said that she thinks that he will not start eating there at all, and although the rule is that they release cats home only when they eat on their own, here she thought that Albert should go home; there he had a greater chance of getting well again. We booked a time for an ultrasound exam next week and went to the hospital to get Albert. A nurse came into the waiting room with our little white cat. He stared into empty space, not moving, in total cramp. I called him. Nothing. I opened the cage and lifted him. He was completely stiff, no softness in his limbs, nothing. His whole being was in cramp. I kissed him and started cuddling with him, and then he said a soft: “Mew”. “Wow, that is something!”, the nurse said. “He was totally non-responsive today”, she added. We got special food for cats with liver problems and went home. Albert started crying in the car. He established his usual eye contact with me and cried and cried, I guess telling me all about what happened to him. He was not in cramp anymore. He pushed his little shaved paws through the net on the cage door and looked for my hands to hold. When we got home, he yelled one meter from the entrance door and then we heard Leroy yelling back like crazy, in a tone “Albert, I hear it’s Albert!”. It was a total happiness!!! At home Albert got so happy, he purred and showed so much joy! He drank water, he ate some food, we got a medicine in him (a supplement that helps the liver heal). He should be isolated from the other cats, not because he is contagious – he is not – but to see if he goes to the toilette as he should and if he eats. But he is so happy to be where he always is, so we let him be with us in the living room. He cannot go to visit Jossan and kittens, they are isolated in their room, since he was in a hospital, there is always a small risk they get something there. He has been sleeping in my lap for a few hours now, on and off and I am scared to move so I would not disturb him. He seems fine, but his bottom is sore (enema and all he passed I guess). It is good when veterinaries also think about animals’ feelings, not only blood work and rules. Albert wanted to come home, I think he got sad and shocked and home-sick in the hospital (after he got better, stabilizing his condition was primary. That he knew probably that they were helping him with, that is the part when he was charming, on Saturday. After that he considered that their part was done and that he should go home). It is good they let him go home. He does eat here indeed! I hope that it is nothing more serious than constipation and that his liver values got off because of the tummy problems, not the other way round. We’ll know more in three days. Right now we are so happy that he is better and that we have him back. Leroy was constipated once when he was young (he seemed to have less pain than Albert had now and the whole episode was less dramatic). He got IV fluid and some medication to help him pass food easier. It was a one time thing. I hope it is the same case here. I really do. Oops .. somehow I got my other name up .. it’s me .. SUSAN !!! lol!! Albert feels great, he is happy and cuddly. He does not seem sick, not even a little bit! When I think, maybe it was as dramatic when Leroy was sick in his tummy back then, it is easy to forget. Albert played a bit with his favorite mouse, he does not seem sick at all. He despises food for cats with liver problems (that is the same kind they tried to feed him in the hospital, I think he connects it with it now), so I gave him RC food for Siamese cats. He must eat! OH I AM pleased to hear that !! Having a good appetite is a good thing!! Saffy is a little ‘irritated’ at the moment. Well .. from time to time. [We have our family here – and she loves the children even though they are only 2 yrs old and 5 years old !!] Just before we left for the airport on Sunday evening to pick up our family – a little male dog appeared in our garden!! He was still there later .. so we took him to a local vet to check for a chip, but he didn’t have one. [Very unusual here in Portugal] The vet said if we handed him over to him – he would be forced to put him down as he already had 12 ‘lost’ dogs .. Apparently this is the season for throwing out animals here .. because people go on holiday, and there are no kennels etc for them! Horrible ..! Anyway .. he is about a year old, and still a ‘baby’ really … and chases Saffy from time to time! I don’t think he wants to hurt her – but is pretty insistent. Saffy is ‘not amused’ !! We are hoping to find a home for him .. but we may have found ourselves another little stray!! He [we are calling him Toby at the moment!] gets on fine with our dog, Bracken. Hopefully he and Saffy will calm down ….!!! Fingers crossed ! !